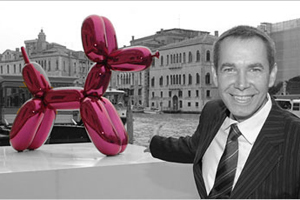 Jeffrey Koons was born in 1955 in York, Pennsylvania, USA. He studied at the Institute College of Art in Baltimore (1972-1975) and at the Art Institute of Chicago (1975-1976). He arrived in New York in 1976 and had his first important public exhibition in 1980. He is the co–founder of the International With Monument Gallery and is considered as one of the main neo–conceptual artists of the 1980s. Recognized as a follower of Duchamp, his kitsch style depicts images from popular culture and aims to communicate with the masses using visual language of mass media and with methods used by the advertising and the entertainment industry.